Judgment Night is a 1993 American action thriller film directed by Stephen Hopkins and starring Emilio Estevez, Cuba Gooding Jr., Jeremy Piven and Stephen Dorff as a group of friends on the run from a gang of drug dealers (led by Denis Leary) after they witness a murder. The film was released on DVD on January 20, 2004. 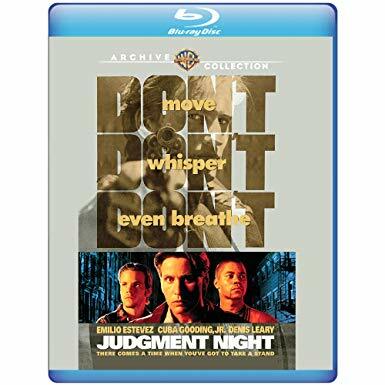 So glad to see the cult hit gem of the 90’s JUDGMENT NIGHT releasing onto blu-ray from Warner Archive. Here we have a DTS HD Master audio 5.1 english track that handles the film quite well. Front heavy, but still a bit of immersiveness from your rears. The picture quality is the best this film has ever looked with a small bit of saturation at times in my humble opinion. Here you get quality acting performances out of Cuba Gooding Jr, Stephen Dorff, and Emilio Estevez that validated their futures to come.